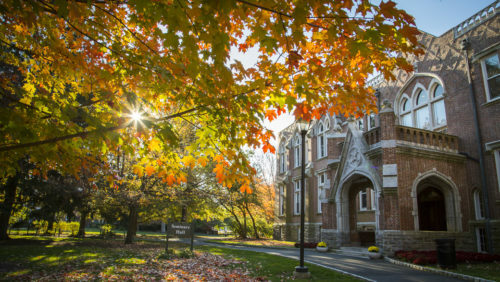 Drew Theological School is a community of scholars, ministers and activists that for nearly 150 years has been educating rooted, innovative and courageous leaders for service to the Church, the academy and society. Theological School students and faculty gather in historic Seminary Hall in The Forest, a beautiful, wooded campus in Madison, New Jersey. With modern classrooms and Craig Chapel, the Theological School also comes together online, through social media and for live-streamed events. Founded in 1867 to provide organized theological education for Methodist Episcopal Church ministers, the Theological School is proudly grounded in and seeking to embody the Wesleyan and Methodist tradition of bold ideas that impact people’s lives for the good. Today, we are a diverse, ecumenical and open community that dares to pursue the love, wisdom and justice at the heart of the transformative gospel of Jesus Christ. The Theological School’s mission joins in the work of the University to offer its diverse community of learners a challenging and individualized education shaped by a deep-rooted culture of mentoring, thoughtful engagement with the world beyond its campus and a steadfast commitment to lifelong cultivation of the whole person. Through its distinctive emphasis on the reciprocity of knowledge, experience and service, Drew prepares its students to flourish both personally and professionally as they add to the world’s good by responding to the urgent challenges of our time with rigorous, independent and imaginative thought. Under Dean Viera’s leadership, Drew University Theological School has now embarked on a process of curriculum transformation that begins with the master of divinity and works out to all degrees. The resulting new curriculum will be fully launched in fall 2018. Drew Theological Seminary, funded initially by Methodist Wall Street financier Daniel Drew, opened its doors in 1867 in the aftermath of the U.S. Civil War and the devastating divisions that had torn apart American Methodism. To mark the centennial of Methodism’s arrival in North America, Methodist leaders sought to renew church and society. They believed that no matter their zeal or natural talent, ministers needed intellectual sophistication, advanced academic training and sharp leadership skills if they were to effectively address the challenges of the day such as the industrial revolution, post-war trauma, income inequality, the plight of slaves and mass migration. In response to such realities, Drew’s faculty designed a curriculum that required ministers to understand and respond to the needs of people around the world. One such minister was Henry Gerhard Appenzeller, who introduced Methodism to South Korea, fostering a 125 year connection that is still going strong today. Of the 13 Methodist seminaries in the United States, Drew Theological School enrolls the greatest number of Koreans (1 in 5). After nearly 150 years, the Wesleyan and Methodist ethos continues to animate the intellectual and spiritual life of the school. Our mission to empower creative thought and courageous action for the common good is not only rooted in our Methodist and Wesleyan heritage, it is alive today in our commitment to training UMC students seeking ordination, our pressing the church and society towards justice and inclusion and our investment in innovative and engaged teaching and learning. We think John, Charles, Henry and Ella would be proud! As one of the 13 United Methodist Seminaries in the United States, and the only school chartered by the General Conference, the Theological School is a center for Methodist and Wesleyan research and learning. Home to the United Methodist Archives and History Center, the Theological School welcomes researchers and hosts visiting Methodist scholars from around the world. The Theological School faculty also offer in-person and online versions of all six of the denominational courses required for ordination in the United Methodist Church. Students from Union Theological Seminary, New York Theological Seminary, Lancaster Theological Seminary and Lutheran School of Theology in Philadelphia can register for these courses as visiting students. Drew Theological School named one of the "Seminaries that Change the World" for 2017.